According to the Journal of Safety Research, in recent years, bus accidents have led to increased public concern about how to reduce the risk of accidents. Data shows that inexperienced and younger bus drivers are more at risk of accidents as are bus drivers who are older than 55 years of age. High speeds can also lead to deadlier crashes, as can accidents that take place at intersections. There isn’t a wealth of data on injuries specific to bus accidents. Bus crashes are sometimes grouped in with large truck commercial accidents, making it difficult to discern the real impact of bus accidents in the U.S. City and school bus data is also differentiated. The National Transportation Safety Board’s most recent reports (dating back to 2009) indicate that 241 million trips were taken on charter and tour buses. These numbers don’t account for smaller bus businesses. Research indicates, however, that passengers of buses and commercial motor vehicles may be more at risk of being involved in a fatal accident than other vehicle types. As more people choose to opt for more eco-friendly options, such as public transportation and buses, we may be seeing more injuries and deaths of people opting to take this mode of transportation. Understanding your rights should an accident occur is incredibly important. If you have been injured in a bus accident, it is important to understand that you may have significant legal protections and options under the law. The bus accident attorneys at the Law Office of Brian K. Branch in Albuquerque, New Mexico work with victims of these kinds of crashes. You may be entitled to receive compensation to cover medical costs, lost wages, and pain and suffering damages after an accident. Bus operators may carry high insurance policies that can cover your medical costs and other expenses. Contact our firm today if you’ve been hurt in a bus crash. Buses are generally safe modes of transportation. Every day, countless people ride school buses and public buses to work, school, and to explore their cities. In most cases, these rides are uneventful. According to the National Highway Traffic Safety Administration, school buses are the safest of all vehicles on the road. In fact, children are safer riding the bus to school than taking a car. In fact, statistically, a student in 70 times more likely to get to school safely when riding a school bus than when riding any other mode of transportation. Yet, riders of charter buses, long-haul transportation buses, and other bus services may be more at risk. As many as 63,000 buses may be involved in an accident in a given year. Double decker buses may pose unique risks. According to the Journal of Accident Analysis and Prevention, double decker buses have a higher center of gravity and can result in more serious accidents should the driver be speeding or should a crash take place. Unfortunately, when bus companies fail to follow federal laws regarding hours of service, or when drivers themselves break the law, tragic accidents can occur. Drivers are required to abide by hours of service laws. However, sometimes companies, in an effort to protect their bottom lines, may urge drivers to remain behind the wheel for longer periods of time. Just as texting and driving and cell phone use have reached epidemic proportions in the general population, so have bus drivers similarly been affected by this dangerous trend. Bus drivers who spend long hours behind the wheel may be tempted to check text messages or answer their phones while driving, endangering the lives of everyone on board. 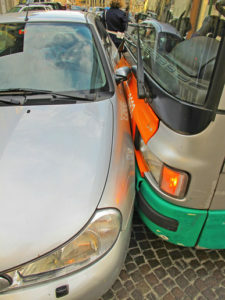 Bus accidents, like truck accidents, may involve many different parties. For instance, in a single accident, many people or parties may be at fault. There are the drivers, the bus company, the maintenance crews, and other drivers on the road who could be at fault. The bus accident attorney at the Law Office of Brian K. Branch in Albuquerque, New Mexico is qualified to review the facts of your crash and identify all stakeholders involved. Our firm fights to hold those responsible accountable for their actions. If you’ve been hurt while riding on a bus, you have important rights under the law. You may be entitled to seek compensation for your medical expenses, lost wages, and pain and suffering damages. The Law Office of Brian K. Branch in Albuquerque, New Mexico is a bus accident lawyer who protects the rights of passengers who have become the victims of a driver’s negligence or neglect. When you ride a bus, you entrust your life to a driver and a company. You trust that the bus will have been properly maintained, that the tires are sound and that the brakes work. You trust the driver to act responsibly—to avoid dangerous practices such as texting and driving, drinking and driving, and speeding. You trust that you’ll make it to your destination safety. Sadly, some don’t make it to their destination. Accidents happen and, in many cases, these accidents could have been prevented. If you’ve been in a bus crash, you need the Albuquerque, New Mexico bus accident attorneys at the Law Office of Brian K. Branch. Our firm can fight a range of stakeholders to hold them accountable for their negligence or neglect. When companies and drivers place their bottom lines over the safety of their passengers, they should be held accountable. You may only have a limited amount of time to make a claim. Call us today at 888-972-1212 to learn more about your rights and options.